August was highlighted by a surprise visit from Rev. 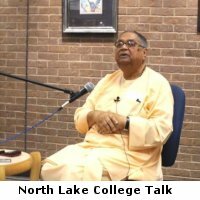 Swami Swahananda, the Spiritual Leader of the Ramakrishna Vedanta Society of North Texas, and Swami Aniruddhananda from India. The swamis arrived on August 20, and the following evening the Society held an impromptu and joyous reception for them, which was well attended. The Sunday Janmashtami Celebration day was also an inspiring occasion. 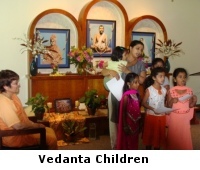 Seminar participants gave thoughtful presentations on the yogas in daily life, and the Vedanta children chanted and sang Krishna bhajans for those gathered. August has also been a month of outreach to the cultural, academic, and interfaith communities of the greater Dallas area. In early August the North Texas Hindu Mandir invited our Society to their fundraising sitar performance by renowned artist Pandit Debi Prasad Chatterjee with Vishal Naggar on tabla. 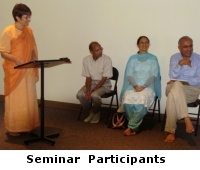 The Hindu Mandir has kindly invited us to participate in both past and upcoming functions. 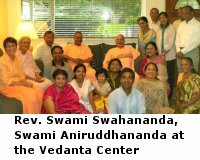 The Ramakrishna Vedanta Society recently invited the minister of the Unitarian Universalist Church of Oak Cliff and his wife to join us for our Sunday lunch. We look forward to collaborating with the Unitarian Universalist Church on future religious gatherings and interfaith events. 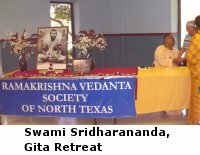 Without the dedicated efforts and generous donations from many of you, our Ramakrishna Vedanta Society would not be able to bring guest swamis of the Ramakrishna Order to Dallas; nor would we be able to provide such spiritually and educationally enriching events to so many devotees, students, and newcomers. On behalf of our Trustees, please accept our heartfelt gratitude to you for supporting such a worthwhile cause.